The United States is seeking a United Nations Security Council resolution calling on Venezuela to conduct free, fair and credible presidential elections with international observers. The US move has prompted Russia to propose a rival resolution, essentially raising concerns over outside interference in Venezuela's internal affairs. Moscow has refused to support a US-led campaign to recognize Venezuelan opposition leader and head of the country's elected National Assembly Juan Guaido as president and continues to back Venezuelan leader Nicolas Maduro. Guaido last month declared himself interim president, challenging Maduro's rule. 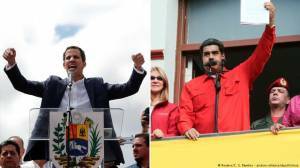 More than 40 nations, including the US, major European powers, including Germany, and most of Latin America have recognized Guaido as the country's interim head of state. The US-drafted resolution, which was discussed privately on Friday by diplomats from the 15 Security Council members, expresses "full support for the National Assembly as the only democratically elected institution in Venezuela." The draft resolution expresses concern over "violence and excessive use of force by Venezuelan security forces against unarmed, peaceful protesters." Read more: Venezuela's political crisis: How did we get here? During discussions on the draft resolution, Russia — which has accused Washington of backing a coup attempt in Venezuela — proposed an alternative text, diplomats said. The Russian draft expresses "concern over the attempts to intervene in matters which are essentially within the domestic jurisdiction." It also expresses "concern over the threats to use force against the territorial integrity and political independence" of Venezuela. US President Donald Trump has not ruled out a military intervention in the Latin American country. It was unclear if or when either draft Security Council resolution could be put to a vote. Read more: What's at stake for Russia in Venezuela? The US draft resolution is pushing the Security Council to facilitate the delivery of humanitarian aid to Venezuela. Washington has accused Maduro of blocking its shipments of food and medicines for the Venezuelans. Earlier this week, Maduro ridiculed the US for offering small amounts of assistance while maintaining sanctions that block billions of offshore assets and revenue. Maduro blames US sanctions for his country's economic woes. Venezuela is struggling with hunger, preventable diseases and hyperinflation.